What do we mean by “Cheap Generators?” The word ‘cheap’ has negative connotations. Is it cheap in quality or cheap in price? It’s an important distinction that we need to clarify. The focus of this article is to give you an overview of factors to consider when buying a portable generator and to provide you with some excellent generators for you to choose from that provide a lot of value for your hard-earned money. They aren’t cheap in quality — but rather, exceptional quality for the money they cost. Basically, these are some of the best generators for the money. I remember the 2011 East Coast power outage like it was yesterday, probably because I’m still waiting for my fingers and toes to defrost. In an unexpected turn of events, we were blasted with a snowstorm much earlier than expected and it caused a huge amount of devastation. Some unlucky people even had to survive without any power for 10 days, which couldn’t have been anything less than torture. A smart person will never make the same mistake twice, so after life got back to normal I went out and bought myself a portable generator. If anything was to go wrong again, I wasn’t going to be anything less than fully prepared. Hopefully you also see the benefits of having a cheap generator handy, but let’s look at some of the main things you can use it for. Why You Need A Portable Generator? The majority of home owners want to buy a generator for one of two reasons. They either use it as a backup power system in case of an emergency, or it might be to power their tools when they’re in the garden nowhere near a socket. There are other uses like camping trips as I’m sure you’ll know, but we’ll focus on the specifics of generators capable of serving your main needs. The first thing you’ll want to know is why some are more expensive than others. First of all, it’s worth pointing out even the cheap generators on sale today will be good enough for the average person. That being said, there are a few differences we can look at now because you’ll have to compromise on a few things if you want the best deal. Cheap generators don’t usually come with a long extensive warranty when you compare them to pricier models, although you will get a limited warranty with all the generators we’ll speak about today. The superior service support has more to do with the fact expensive models are usually sold by more reputable brands like Yamaha, but some popular brands do still have cheap generators. Larger companies will also have more service centers nationwide, which means you won’t have to wait too long for repairs. A big, powerful generator will be more expensive. The real question you need to ask yourself is how powerful your new generator needs to be, and there is a quick way to work it out. First you have to add up the total wattage of all the appliances and devices you plan on hooking up to the generator, then you have to make sure the running wattage is capable of handling the load. All the cheap generators we’ll look at today will have the their wattage clearly stated. Lots of power for the money. Great value. Starting Watts vs Running Watts: as a side note, portable generators will have a different starting (surge) and running wattage rating. Some bigger appliances, such as a central air conditioner, will need a short power surge for a while as they get up and running. If you plan on running any of them from your generator, you will have to take the starting watts into account when you’re deciding which one to buy. The more expensive a generator is usually determines the efficiency of the engine if all other things are equal, and if it has a better engine it will improve the fuel efficiency. What you’re left with is a generator that will run a lot longer and it will use less fuel. This isn’t always necessarily true because a conventional generator with a huge engine could run for days, but if they’re of equal size the generator with a more efficient engine will always win out. I’d like to talk about another couple of characteristics of expensive generators, but they also happen to be much more prominent in inverter generators compared to conventional ones. Before we go any further, you’ll have to understand what the difference is between the two kinds. Although it’s rather complicated, we’ll try to keep the explanation as simple as possible. It’s important to buy the right generator to match your needs. Conventional Generators — an old fashioned piece of technology drawing on a fuel source to power a motor. The motor is attached to an alternator and it produces electricity when it’s running. The conventional generator runs at a constant speed to produce the current that powers your appliances. If it fluctuates it will affect the frequency of the power output, which is why it’s not a good idea to charge expensive and delicate electronics with them. Inverter Generators — inverter generators are much more modern, and their 3-phrase generator produces an AC current. It’s then converted into a DC current before switching back into an AC current once again. This process produces a pure sine wave, which is a much cleaner energy output. They also don’t need to run at the same speed when you switch them on. In fact, an inverter generator will throttle back when you’re running lighter loads, so they’ll only produce the power output specifically asked of them. It means they’re more fuel efficient than any conventional generator even if it’s expensive. We’ll now go back to looking at the advantages of more expensive generators, and in each example inverter generators will always win. Just like the fuel efficiency being better in conventional generators because of the engine, they’ll be a lot more portable too. That doesn’t mean a massive 50,000W conventional generator will be portable, but if there are two with equal power outputs the more expensive one will be easier to move around because the engine will be smaller. Inverter generators throw everything out of the window, because they’re only a few cubic feet even if they have a very respectable power output. More expensive conventional generators will be quieter if they have the same power output, and it’s thanks to the more efficient engines we’ve discussed at length. They still have to run at maximum speed, so they’re never going to be easy on your ears. Inverter generators win this contest by a thousand miles as they’re basically silent. An expensive one made by Yamaha might be as loud as a normal conversation if it’s not running on full load or as loud as an electric shaver when it is, so there is no way you’ll hear something running at 60 decibels unless you’re close to it. There are a couple of extra bonuses you’ll get when you opt for an inverter generator, and it’s important you know about them before you decide which generator to buy. First of all, you’ll be able to combine more than one of them together in most cases, so if you’re scared about the starting and running watts being lower you shouldn’t be. The quality of the power output being so much greater also means you don’t need to be afraid to connect delicate devices with sensitive microprocessors to them. 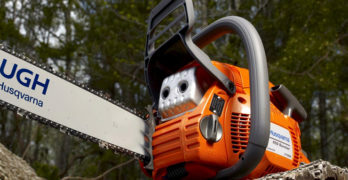 At the beginning of the article we spoke about two of the biggest reasons why you would need a generator, which were for emergencies and using power tools in your garden. Before we start looking at the best cheap generators for your money, it would be good if you had a rough idea of how much watts you’ll need for different appliances and tools. Remember your starting (or surge) watts could be around 2-3 times what you’ll find below. Another storm has hit, your power are gone, and you’re desperate to run certain appliances to help you through the rough times. Here are the watts you will need to add up, which are only rough estimates on the high end to keep you on the safe side. The real wattages can be found somewhere on your appliances or online. Feel free to safely assume most of your other much smaller devices won’t make a big difference. Your smartphone or electric shaver isn’t going to push the generator over its limit. If you need your generator to carry out garden chores, it will be good to know what it can handle. Normally you would only have one power tool running at the same time, so any generator we talk about today could handle anything, but you can still use a few at the same time if there is someone else with you. Earlier on we spoke about the difference between expensive and cheap generators, but it doesn’t mean we’re now going to list a bunch of subpar products. We are looking at the best cheap generators you can get for your money, which is much different to talking about the cheapest ones on the market. Each of these should easily meet the needs of the average person, and they’re all loved by a lot of people even though they’re not known as superior brands in the same way Honda and Yamaha are. Now you should have a good idea about how generators work and why they’re so important, so all you need to do now is choose one. This is the part most people find the trickiest, as you’re spoiled for choice and they all have their own special qualities. Perhaps it would be good to pick out the best things about each one, and you can click through to carry out more in-depth research on the ones that catch your eye. Affordable, reliable and strong build quality. 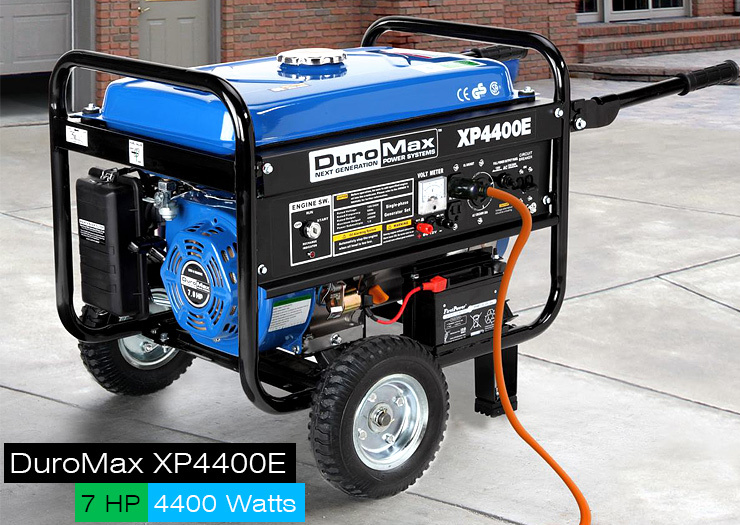 The DuroMax XP4400E is a lot heavier and larger than the last generator we looked at, so it’s the kind you want to keep at home. It has a wheel kit, so even though it’s a little over a hundred pounds you won’t have any trouble wheeling it around. Although you can use it with power tools in the garden, it would be perfect in an emergency situation when the weather isn’t great, as it’s heavy duty with a roll cage so very difficult to suffer from damage. One thing you’ll enjoy is the electric key start, which means as long as the battery is charged you won’t need to use the recoil start. Due to the ease in which it can be wheeled around, you can take it with you into the outdoors because it’s okay to use in national parks. It’s also a popular choice of generator to keep on a building site, partly thanks to its twist lock outlet for high-powered tools. If it’s good enough for there, it’s good enough for your home. The perfect size for most homeowners. 9000 starting watts / 7500 running watts. Electric start, with battery included. 420cc cast iron sleeved motor. Quiet : Pulse-Flo muffler. One of the quietest generators available. 11 Hour run time at 50% load. Comes with wheel kit, Oil and funnel included, and assembly tools. The Westinghouse WH7500E is an absolute monster, and 7,500 watts is only its running output. The starting output sits at 9,000 watts, so you could run more things from it than anything else on the list. It’s perfect for those who have a larger home, whereas there are maybe better choices if you’re only going to use it to power your tools when you’re working in the garden. Speaking of the outdoors, this generator is made for sitting outside. You’ll need to keep gas powered generators away from your home for your safety anyway, but what will you do if you don’t have power and it’s still not nice outside? 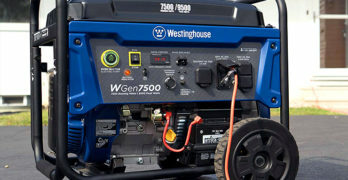 The Westinghouse WH7500E is fully enclosed, so it will protect all the electrical connections no matter how terrible the weather is. It’s too heavy to ever blow over, and it will run for 12 hours at 50% load, which you’re never likely to reach because it’s so powerful. Ultra quiet and built to endure over time. Excellent generator. 8″ never flat mobility kit, Oil funnel, Spark plug socket and Wireless remote. Champion is one of the market leaders when it comes to power equipment, and they cater to everyone’s needs. Thanks to the large budget they have to work with they always try to innovate, and the Champion Power Equipment 46539 has a cool feature you’ll love. Instead of going outside and tugging on a cord, you’ll be able to start the generator remotely using a special remote control and it will work when you’re up to 80 feet away. If anything else, you won’t have to trek outside in the bad weather when you want power. It has big 8-inch wheels to help you move the generator around, because it’s a little on the heavy side. There isn’t a big drop between the starting and running watts, so you’ll be able to power lots of appliances easily. It’s also got good stamina, and at 50% load it will keep going for 12 hours on a full tank. WEN is a trusted brand that’s been around since 1951. The WEN 56180 doesn’t come with any wheels to help you move it around, but there is a good reason why. At only 50 pounds, it’s by far the lightest generator we’ll look at today. The size and weight of the generator means it’s the perfect option for those who want to power a few things in an emergency. It only provides 1,500 running watts so it can’t power everything in your home, but on the plus side it’s dirt cheap. WEN also have a huge number of generators all varying in power, so if you’re willing to spend a little extra you can get all the wattage you need. We’re only mentioning this one today as it’s the perfect generator for those on a tight budget, but don’t let the price fool you. Using the running time as an example of its quality, with only 1.45 gallons of gasoline it will still run for 7.5 hours at 50% load, so it’s just shy of the others on the list. Compact, quiet and more affordable than competitive brands. lightweight & Compact: Up to 40% lighter than a standard generator of equal watts. Built-in handle – move with minimal effort. 1600 watts of clean power to safely power sensitive electronics. Electronic circuit breakers protect against overloads. FlexPower saves fuel and reduces noise. We’ve looked at the most affordable generator on the list, and because the Generac 6866 iQ2000 is an inverter generator we’ll now cover the most portable. The iQ2000 doesn’t get as much attention as something like the Yamaha EF2000iS, which is a shame because it only falters due to the brand name. The inverter generator itself is fantastic, and it delivers the same running watts at 1,600 even though it’s less expensive. One area that stands out is the display panel, and one of the many cool features is the LED PowerBar showing you what the wattage is at all times. It will even let you know how much fuel you have left to use before it will need to be filled up again. The Yamaha EF2000iS is known for being one of the quietest generators on the market, but the Generac 6866 iQ2000 has been shown in independent tests to be quieter than its competitors. The advantage of propane is that it burns cleaner than gas. The Sportsman GEN4000LP is a propane generator. If you don’t already know, propane has a couple of advantages. First, propane doesn’t degrade over time like gasoline so you can store multiple propane tanks in case of emergency knowing that they will usable. This is a big bonus. Gasoline has a limited shelf life in storage. How long will stored gasoline last? About 3 to 5 months or, if you add fuel stabilizer it can last up to 24 months. Another advantage of a propane generator is that it burns much cleaner than a gasoline generator — around 40% cleaner. Even when you’re buying cheap generators you don’t want them to break down, so it’s nice to see the Sportsman GEN4000LP comes with both an auto fuel shut-off safety valve and auto low oil shutdown. It also has an automatic voltage regulator, although you’re still taking a chance if you decide to charge expensive devices on any conventional generator. 4,000 is the starting watts, and the running watts is still an impressive 3,250 watts. Unless you have never lifted anything heavy in your life, you’ll find the Sportsman GEN4000LP is easy to carry around. 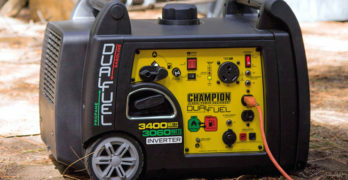 It makes it a great generator for overnight camping trips or any other adventures you go on, and the propane gas means it will run quietly giving off no foul smells as you sit around the campfire. It will still keep chugging away for around 10 hours unless you overload it, so it’s very unlikely to need refueled. Sportsman generators are made by Buffalo Corp., a company that makes a wide range of generator sizes to meet your needs. Please read the instruction manual carefully when your generator arrives, as it will tell you everything you need to know in order to stay safe. If you want an example of the dangers they pose, including how to avoid them, we’ll look at the main dangers the Occupation Health and Safety Administration have come out with because they’ll still apply to you. Carbon Monoxide is the gas that kills you silently, because it’s colorless and odorless. I’m sure you’ve heard of people passing away while they sleep because of a carbon monoxide leakage in their home. Any internal combustion engine running on a fuel source, including your generator, will need to be kept outside at least 10 feet away from your home to allow for air movement. Do not start the generator indoors under any circumstances and you’ll not be poisoned. If your generator has been running for a while it’s going to be hot, even if you don’t have many appliances hooked up to it. It becomes a fire hazard when it’s time to refuel the generator, because pouring any kind of fuel straight on top of boiling hot engine parts could cause it to ignite. If you do need to refuel your generator in the middle of using it, you must still turn it off completely and let it cool down first. The next danger is related to fuel storage, which will play a big role in your life if you decide to buy a generator. This is especially true if you end up buying a generator for emergencies, because you’ll always need to have a fuel source on hand. It should be kept outdoors and labeled, plus it should never be kept beside a heat source. If you’re running the generator your jerry cans must be kept well away from it. Some generators will be a lot louder than others, and if you are exposed to prolonged noise it could have a negative impact on your hearing. It shouldn’t be a problem if your generator is kept as far away from your home as possible. You won’t need to wear any ear protection like those working on a building site, but it would help if you kept your windows closed if they don’t have cables running through them. Please Note: Although not mentioned as one of the main hazards by the Occupation Health and Safety Administration, don’t forget you’re dealing with a machine producing electricity. As such, you should always be aware of electrical hazards like broken cables. Even the cheap generators these days will be built with safety in mind when it comes to electricity, so apply common sense and follow the same rules you would use with plug sockets. As you can see from all the things we’ve covered today, cheap generators are well worth the investment if you can afford one. Not only will they save you from running electrical cords out of your home when working in the garden, but the ability to power your appliances and devices when a disaster strikes will make your portable generator worth its weight in gold. The only thing you’ve got to contend with now is choosing which one to buy, and the list of generators we’ve discussed today should give you a good idea of the strengths and weaknesses of certain ones. You must click through to read the full description of any generator you like, and you’ll be able to dig into every little detail about them before you spend any money.